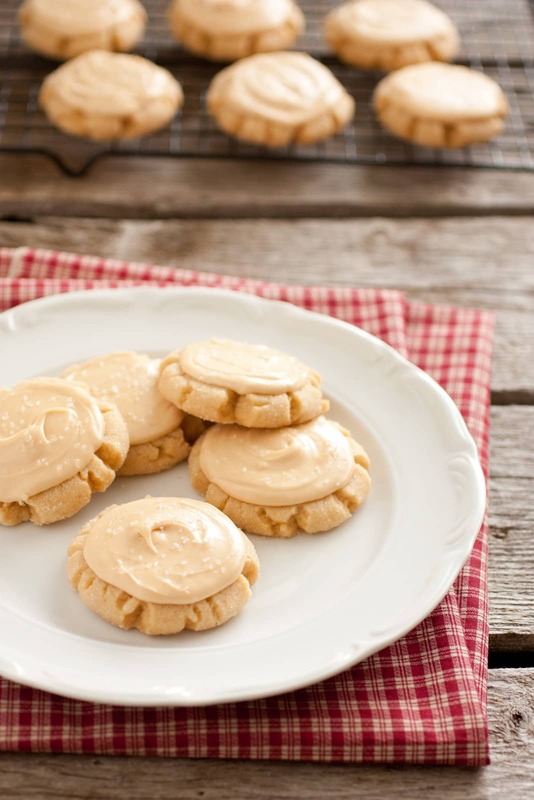 Looking for a new favorite cookie recipe? With these, I know I’ve found one of mine. This is a cookie that will melt in your mouth as you savor every last exciting flavor it has to offer. 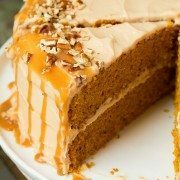 It’s loaded with decadent, rich, browned flavor (from not only the browned butter but the browned sugar of the caramel). I love the pairing of browned butter and caramel because they are both forms of browned ingredients. They just makes sense to go together don’t they? The coarse sea salt takes these to a whole new gourmet level. You get lots of sweet with a delicious sprinkle of the perfect amount of salty. 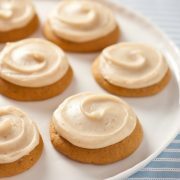 These cookies are simply amazing all on their own (without the Salted Caramel Frosting) but the silky frosting just adds so many exciting flavor compliments to the cookie that they just shouldn’t to be made without it. Enjoy and share! Soft chewy cookies with a rich browned butter flavor paired with a delicious caramel frosting! Heat butter in a medium saucepan over medium heat. Cook just until butter has browned, swirling occasionally (butter will go through stages, it will melt, then splatter a bit, then foam and golden bubbles will begin to appear in the center on the surface with little brown specs - this is when you want to remove it, don't burn it). Pour butter (and scrape out all of the browned butter with a rubber spatula) into a heat proof bowl. Allow butter to cool until just warm to the touch, about 20 - 25 minutes. Preheat oven to 350 degrees. In a mixing bowl, whisk together flour, cornstarch, baking powder, baking soda and salt, set aside. Add cooled butter, 1/2 cup granulated sugar and light-brown sugar to an electric stand mixer and mix until well blended. Add in egg, egg yolk and vanilla and mix until combine. Slowly add in dry ingredients and mix just until combine. Scoop dough out 1 1/2 Tbsp at a time and form into balls (dough will seem a bit dry, I think this is due to using warm butter it seems to slightly begin the cooking process before baking), then pour 1/4 cup granulated sugar into a small bowl and roll balls in sugar to evenly coat. Place sugar coated dough balls onto a Silpat lined or greased baking sheet. Using the bottom of a flat measuring cup or drinking glass gently flatten each ball to 1/2 inch, then bake in preheated oven 9-11 minutes. Allow to cool several minutes before transferring to a wire rack to cool. 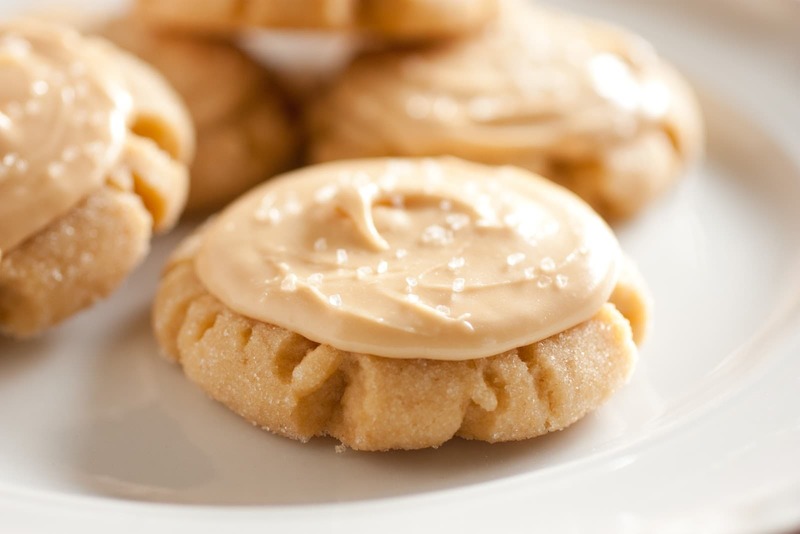 Cool completely then frost each cookie with Salted Caramel Frosting and sprinkle each cookie evenly with a small pinch of sea salt immediately following (so the salt sticks before frosting sets). Store cookies in a single layer in an airtight container. In a large mixing bowl, using and electric hand mixer on low speed, whip together caramel sauce, butter and vanilla until pale and smooth about 1 minute. Add in powdered sugar and mix until well blended and smooth. 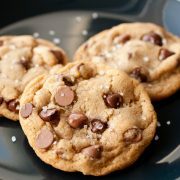 Use coarse sea salt to sprinkle over frosted cookies.